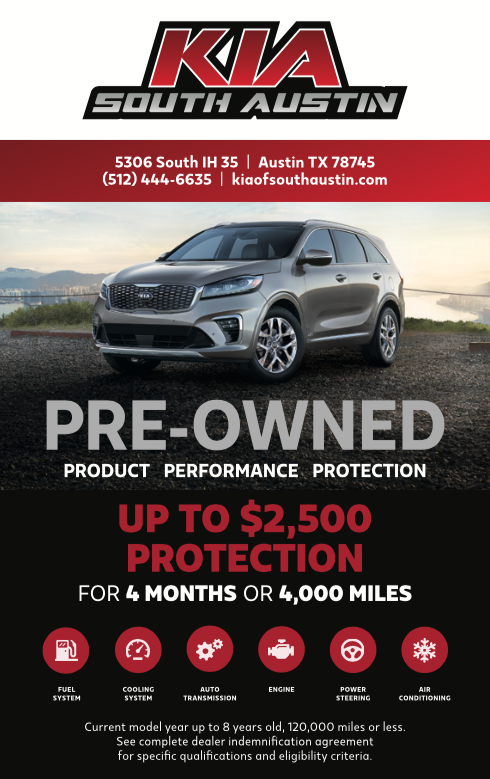 Kia of South Austin invites you to search our fantastic stock of used cars, trucks, and SUVs for sale near me in Austin, TX. Our customer service specialists are standing by to help you find the next car of your dreams. Plus, don’t forget to ask about our used car financing program. From perfect credit to low credit, Kia of South will work hard to get you the used car financing you need. View our inventory online, stop by for a test drive, or call (844) 248-5489 today. 2015 Kia Optima LX Sedan Electric Power Steering 16 Alloy Wheels Kia of South Austin. Located on the Magnificent Motor Mile! 5306 IH-35 South, Austin, Texas 78745 512-444-6635 www.kiaofsouthaustin.com MECHANICAL 2.4 L Gas Direct Injection (GDI) 4-Cyl Engine 6-Speed Sportmatic Transmission Electric Power Steering 16 Alloy Wheels Kia of South Austin. Located on the Magnificent Motor Mile! 5306 IH-35 South, Austin, Texas 78745 512-444-6635 www.kiaofsouthaustin.com SAFETY Dual Front Advanced Airbags Front Seat Mounted Side Airbags Full-Length Side Curtain Airbags Lower Anchors and Tethers for Children (LATCH) Anti-Lock Braking System (ABS) Traction Control System (TCS) Electronic Stability Control (ESC) Vehicle Stability Management (VSM) Hill-start Assist Control (HAC) Kia of South Austin. Located on the Magnificent Motor Mile! 5306 IH-35 South, Austin, Texas 78745 512-444-6635 www.kiaofsouthaustin.com INTERIOR, COMFORT & CONVENIENCE Air Conditioning Power Windows and Door Locks AM/FM/CD/MP3 Audio System SIRIUSXM w/free 3-mo. subscription* USB and Auxiliary Input Jacks Bluetooth Wireless Technology Driver's Seat w/ Power Lumbar Support Front and Rear Cup Holders Remote Keyless Entry Cruise Control Tilt & Telescopic Steering Column Steering Wheel Mounted Audio Controls Trip Computer Cooling Glove Box Kia of South Austin. Located on the Magnificent Motor Mile! 5306 IH-35 South, Austin, Texas 78745 512-444-6635 www.kiaofsouthaustin.com EXTERIOR Front Fog Lights Heated Outside Mirrors w/ Turn Signal Indicators Dual Exhaust with Chrome Tips Carpeted Floor Mats Kia of South Austin. Located on the Magnificent Motor Mile! 5306 IH-35 South, Austin, Texas 78745 512-444-6635 www.kiaofsouthaustin.com Your buying risks are reduced thanks to a CARFAX BuyBack Guarantee. When it comes to high fuel economy, plenty of versatility and a great looks, this KiaOptima LX cannot be beat. This Kia Optima's superior fuel-efficiency is proof that not all vehicles are created equal. In addition to being well-cared for, this Kia Optima has very low mileage making it a rare find. More information about the 2015 Kia Optima: Compared to other mid-size sedans, the Kia Optima stands out in many ways. Showcasing Kia's more Euro-influenced design direction, the Optima's styling is much more edgy than that of most other mid-size sedans. The Optima's design is functional, too, and quite roomy on the inside. The Optima is also one of the most fuel-efficient mid-size sedans, offering strong mileage in addition to its sporty performance. The turbocharged engine in the SX-Turbo and Limited trims provides the power and acceleration of a V6 but the gas mileage of a four. Kia continues to offer an excellent 10-year warranty on powertrain components. This model sets itself apart with strong value, capacious interior, hybrid powertrain available, excellent warranty, fuel-efficient powertrains, and Crisp, Euro-influenced styling Kia of South Austin. Located on the Magnificent Motor Mile! 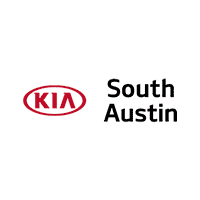 5306 IH-35 South, Austin, Texas 78745 512-444-6635 www.kiaofsouthaustin.com We are on The Magnificent Motor Mile!!!! 2015 Kia Soul ! The Whole Shabang Package Kia of South Austin. Located on the Magnificent Motor Mile! 5306 IH-35 South, Austin, Texas 78745 512-444-6635 www.kiaofsouthaustin.com MECHANICAL 2.0L Gas Direct Injection (GDI) 4-Cyl Engine 6-Speed Automatic Transmission w/ Active Eco System Electric Power Steering 18 Alloy Wheels Kia of South Austin. Located on the Magnificent Motor Mile! 5306 IH-35 South, Austin, Texas 78745 512-444-6635 www.kiaofsouthaustin.com SAFETY Dual Front Advanced Airbags Front Seat-Mounted Side Airbags Full-Length Side Curtain Airbags Anti-Lock Braking System (ABS) w/ Brake Assist (BAS) Traction Control System (TCS) Electronic Stability Control (ESC) Vehicle Stability Management (VSM) Hill-start Assist Control (HAC) Tire Pressure Monitoring System (TPMS) INTERIOR, COMFORT & CONVENIENCE Air Conditioning Power Windows and Door Locks AM/FM/MP3 Audio System UVO eServices Telematics w/ Rear Camera Display SIRIUSXM w/free 3-mo. subscription* USB and Auxiliary Input Jacks Bluetooth Wireless Technology Kia of South Austin. Located on the Magnificent Motor Mile! 5306 IH-35 South, Austin, Texas 78745 512-444-6635 www.kiaofsouthaustin.com Power Driver's Seat Center Console w/ Armrest & Storage Bin 60/40 Split Folding Rear Seats Remote Keyless Entry Cruise Control, Trip Computer Tilt & Telescopic Steering Column Leather-Wrapped Steering Wheel and Gearshift Knob Steering Wheel Mounted Audio Controls Auto-Dimming Rear View Mirror Cargo Cover EXTERIOR LED Positioning Lights and Tail Lights Front Fog Lights Auto-On/Off Projection Headlights Pwr Heated Outside Mirrors w/ Turn Signal Indicators Privacy Glass Kia of South Austin. Located on the Magnificent Motor Mile! 5306 IH-35 South, Austin, Texas 78745 512-444-6635 www.kiaofsouthaustin.com ADDITIONAL INSTALLED EQUIPMENT: (In addition to or in place of standard features) Umber Interior Package 2 $400.00 - Premium Nappa Leather Seat Trim (upgraded leather seat trim) - Umber Colored Interior Accents - Gloss Black Wheel Inserts Kia of South Austin. Located on the Magnificent Motor Mile! 5306 IH-35 South, Austin, Texas 78745 512-444-6635 www.kiaofsouthaustin.com Sun & Sound Package $2,600.00 - Automatic Climate Control - Panoramic Sunroof w/ Power Sunshade (Deletes Roof Rack Ready Mounting Points) - Navigation w/ 8 Screen & Sirius Traffic - Infinity Audio System - Speaker Lights Kia of South Austin. Located on the Magnificent Motor Mile! 5306 IH-35 South, Austin, Texas 78745 512-444-6635 www.kiaofsouthaustin.com The Whole Shabang Package $2,500.00 - HID Low-Beam Headlights - Push Button Start w/ Smart Key - Leather Seat Trim - Heated & Ventilated Front Seats - Heated Rear Outboard Seats - Heated Steering Wheel - Supervision Meter Cluster w/4.3 Color LCD - Engine Immobilizer Rear Bumper Applique $75.00 Carpeted Floor Mats $115.00 Cargo Net $50.00 Wheel Locks Kia of South Austin. Located on the Magnificent Motor Mile! 5306 IH-35 South, Austin, Texas 78745 512-444-6635 www.kiaofsouthaustin.com This vehicle is loaded with great features, plus it comes with the CARFAX BuyBack Guarantee. You could spend more on fuel each month than on your vehicle payments, so why not consider one with exceptional fuel economy like this 2015 Kia Soul. Driven by many, but adored by more, the Kia Soul ! is a perfect addition to any home. More information about the 2015 Kia Soul: The Soul remains one of the more affordable vehicles on the market, priced in line with other compact sedans, very well-equipped and quite fuel-efficient. With the Soul's tiny parking footprint, it's very easy to maneuver and park, still packing impressive interior space thanks to the boxy profile. Adults can fit comfortably in the back seat, which isn't the case with most other vehicles this size. Safety features also get a boost in the new Soul-- the stronger structure has already been proven with Insurance Institute for Highway Safety (IIHS) Top Safety Pick status plus a federal 5-star overall rating. Interesting features of this model are improved ride and handling, boxy design opens up lot of passenger space, a feature set unlike other compact cars, Trend-setting style, and versatility for cargo We are on The Magnificent Motor Mile!!! !